While social selling is quickly becoming the norm, trade shows are still essential sales forums. Learn how to bridge these tactics with these social selling tips. Trade shows are still essential forums for developing client relationships, even in the age where more selling takes place online. Industry events still offer the one thing online sales can’t replicate: live person-to-person interaction. Still, there are opportunities to pair a trade show sales strategy with social selling tips before, during and after the event. Industry shows bring together the latest ideas and strategies from various experts and the informational overload is ripe for content creation and social sharing. Here are the 3 stages of trade show/social selling preparation that can help enhance your selling acumen. Set trade show goals before arriving. How many people will you connect with at the show? How many new followers do you wish to gain from your show content? Plan ahead and be prepared by connecting with fellow attendees (and potential prospects) on LinkedIn before the event. Having that initial connection online will prove valuable and increase the chance that you recognize one another creating an easy introduction in-person. Participate in event-related groups or forums. Eager attendees are likely to engage in groups or forums set up by the event – and you want to be in on the conversation. Develop a reputation as being knowledgeable and helpful before the show begins. While you can collect information from perusing the show’s attendees, conversations are also taking place online. Real-time reactions from attendees and participants can help gauge interest for specific ideas/products/services highlighted at the event, helping you alter your strategy if necessary. Use automated reminders to identify when a prospect mentions something related to your business, and capitalize on that conversation while at the show. You’re at the show to connect with prospects, but you’re also there to provide insight for your own followers. Event-related content helps connect your audience to the event, and positions you as an influencer within the industry. If you have the time, try live blogging a keynote speaker or presentation – it’s an art to capture the speaker’s thoughts in real-time, but your audience will appreciate the instant updates. Follow prospects as you meet them – but don’t be pushy. If you meet new connections at the show, be sure to connect with them on LinkedIn shortly afterward. However, save the selling for after the show – they’re likely inundated with sales pitches, so be the one that stands out and offers a helpful tip or link. Let your content and insight speak for itself, then follow up later with to identify potential next steps. Send personalized, relevant content to prospects. What questions did you hear most often during the show? Collect relevant information from attendees and repurpose it as content for your social audience. Start with a blog post that ties the show’s lessons to prospect concerns and mention prospects on your social accounts (with permission). The conversation doesn’t end when the convention doors are closed. Upload photos from the event to LinkedIn and tag prospects. Tagging prospects helps make a quick connection and makes future connections easier. Organize your tags by industry and/or topic and you can then send emails to all tagged members with targeted content from the show. Trade show selling is hardly an outdated tactic – in fact, social networking has revitalized the traditional person-to-person interactions found in industry convention. By segmenting your preparation before, during and after the event, you can ensure that conversations built along the way will be sustainable. 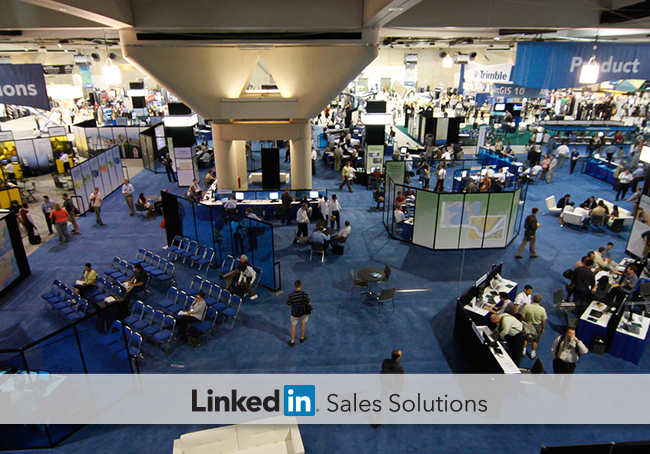 Follow @LinkedInSelling for more sales strategies and tactics.